I’ve already given an in-depth 3 step guide on being an Uber driver. But, I live in Sf. So, because I know the area a little better I’m going to show you how to become an Uber Driver in San Francisco and where the good areas are to drive in the Bay area. It really only takes a few steps to sign up and drive. For those that don’t want to read the whole article can just quickly follow these steps to be an Uber driver. 2.) Get Your Car Inspected For Free At One Of Uber’s Many Activation Centers. 3.) Wait To Pass The Background Check and Driver’s Record Check. 4.) Login Into The Uber Partner App And Drive! Honestly, it’s not much harder than those few steps above. Seriously. 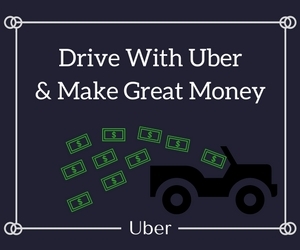 Who Is Uber Great For? Anyone really. If you have a car and meet the requirements then this would be a great way to earn some extra cash. Maybe you’re a college kid. You don’t want a job that you can’t take time off when you need to study. It will just add stress. With Uber you can work one week when there are no test and take the next week off when you need to study for a final coming up. Or maybe you already have a decent job in San Francisco, but you commute an hour each day there and back. It’s not like you get paid for that hour of driving. With Uber you can actually set your destination of where you are heading then on your way to or from work you will pick up and drop off people along your route. Now you are getting paid while you’re on your way home. And then of course, you have the stay at home moms and dads. It can be a full time job taking care of your kid. So, it’s always great to have some flexibility on when you want to earn money. Between feeding your kid, the doctor’s appointments, school, etc… There are days where you just don’t have much time to have a job and take care your kids. With Uber now you can earn extra cash in between all those different activities. Uber’s San Francisco Activation Center at 130 Vermont Street in SF. Uber’s Oakland Activation Center at 1755 Embarcadero in Oakland. Uber’s San Jose Activation Center at 1900 Camden Avenue in SJ. The Uber Stations usually consist of an open parking lot with a tent set up branding the Uber Logo. It usually only takes about 10 minutes to get your car inspected before they send you on your way. Just make sure your car is in good shape without paint damage, broken parts, and a dashboard that glows with different maintenance lights and you should be good. If the above locations are a little out of range for you then here’s a list of other free locations. Make sure when you get your car inspected you take all of your documents to drive just in case they check them again. I actually got a $100 bonus just for getting my car inspected with Uber. Which Areas Are The Best To Drive In The Bay Area? Really, you can drive anywhere. It can change depending on time of day and events as well. The cool thing is Uber sends you an email every week telling you where all the major events will be held. This can help you strategize where you will work week to week. Driving in the major cities like Oakland, San Jose, and San Francisco should definitely help you make a decent income. If you don’t want to drive there. Then that’s totally fine. Although I haven’t tested these cities myself, I have seen Napa being consistently busy and surging a lot. I’ve been tempted to drive up there myself and test it out, but you can always let me know in the comments below when you test Napa out yourself. While I’m sure Napa gets busy because it’s wine country, you also have beach town Santa Cruz. If they weren’t a 2 hour drive I would think about Ubering down there as well. But, if you’re ever down there for vacation and get bored or maybe you just live there. It would be a good idea to see how business is down there. You can always try out the airports since they are usually bigger fares because you have to travel farther to bring the rider to his/her destination. Like I said though, most of the Bay Area is pretty good if you’re Ubering in a decent populated city. The above are just a few thoughts for you, but when you try them out yourself you’ll know for sure. How Does The Uber Partner App Work? OK, so you decide you want to drive, but you’re a little nervous about how everything works. That’s totally fine. The cool thing is Uber does show you a training video of how the app works, but sometimes that not enough. So, with that being said, you can check out this interactive simulator that will give you a real life experience of using the Uber app before you actually pick somebody up. It’s not hard at all to become an Uber driver in San Francisco or really anywhere that it’s available. It only takes a few simple steps. I hope this article helped you out a little bit. Leave a comment below with any questions, thoughts, or concerns and I’ll be sure to respond back to you.